Create your own Podcast Website easily with WordPress. 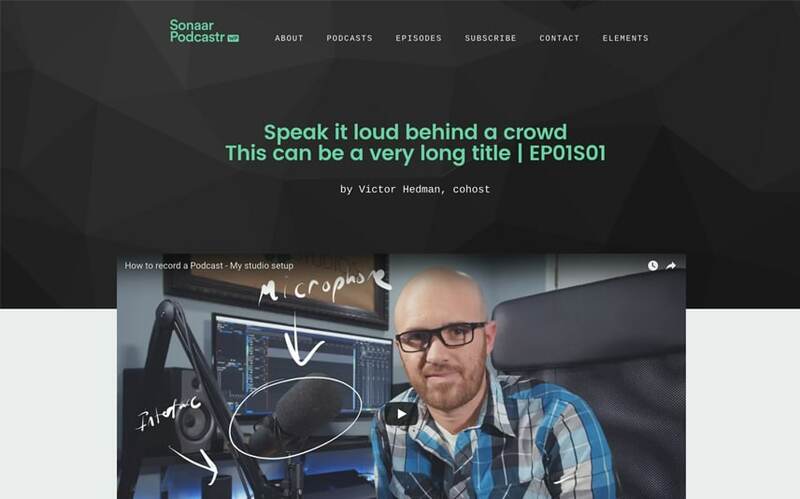 This Premium WordPress Theme for Podcaster provides you all the tools you need to create a very professional podcast website. You will have total control on the design, features and page layouts. 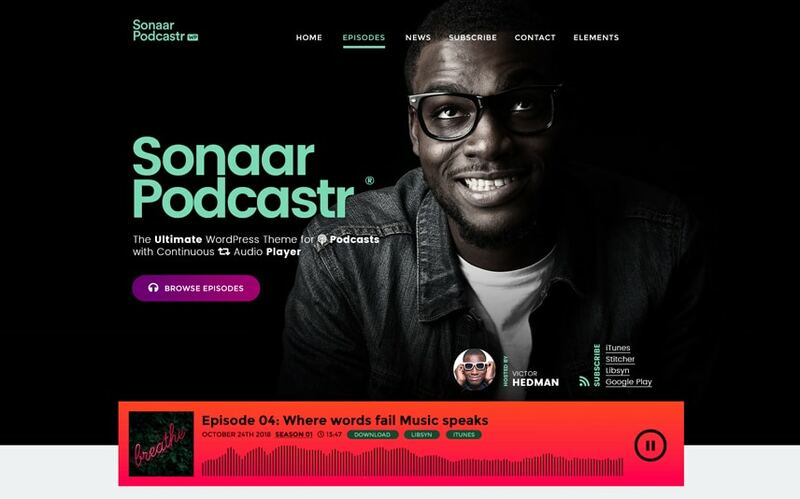 It’s the ultimate Podcast WordPress theme ever built. Our Podcaster template is jam-packed with many options and features specifically designed for Podcasters. 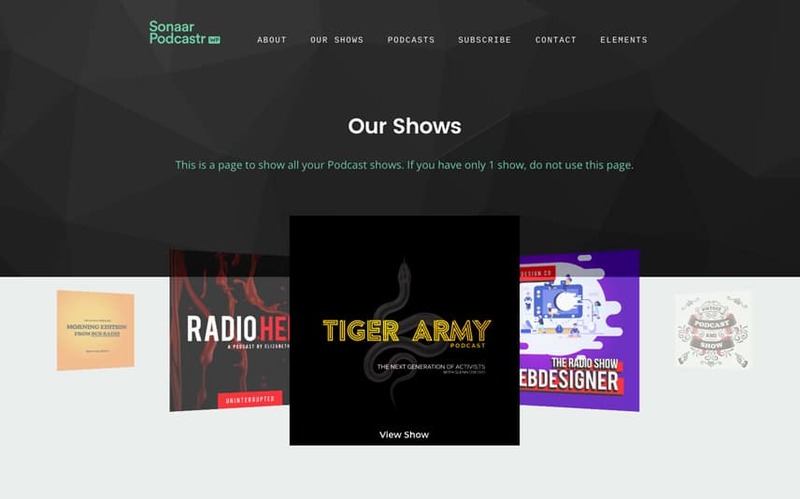 You have the option to use your existing podcast publisher to host, manage and distribute your stream and show the episodes on your website, or host your podcast directly on your own web server. 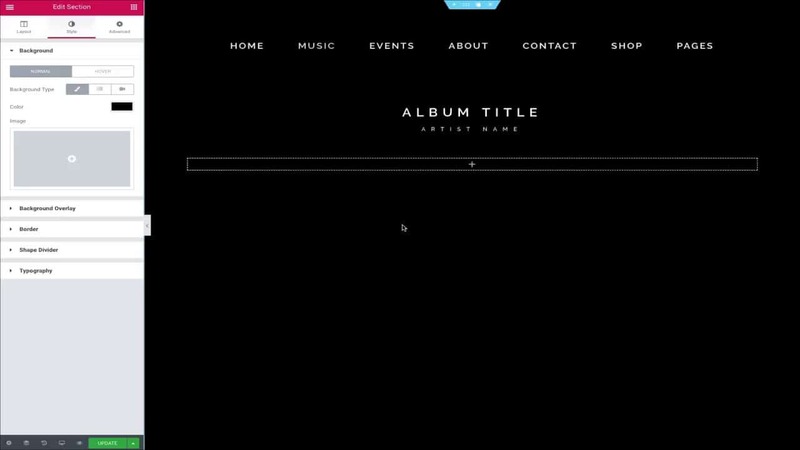 You can create a simple one-pager podcast website or use this theme to create an outstanding podcast network website. It’s the most flexible, yet multilingual WordPress Theme for Podcasters in the industry right now. Detailed statistics & analytics (coming soon!). Your listeners are everywhere. They discover, subscribe and listen to your podcast from different podcast apps such as iTunes, Google Podcasts, Spotify, Deezer, etc. For publishing podcasts to those platforms, you will be required to provide them with an RSS feed and that’s it! This theme is specially designed for Podcaster so it will automatically generate a compliant RSS feed for you. All you will have to do is submit it to the aggregators where you want to air on! As soon as you will add new episodes to your website, the aggregators will be notified and your new episode will show up to your subscribers! Move your podcast from Libsyn, Blubrry, Simplecast or any other platform to your own website is easier than you think! It also means no more monthly fee! If you have existing episodes hosted on a different platform, the first thing you’ll want is to import them into your new podcast WordPress theme. This will save you tons of time! Simply copy/paste your RSS feed URL into our easy Podcast Import Tool and we will automatically fetch and import podcasts into your website! In addition, if you’re already hosting podcasts on a different platform such as Libsyn, Anchor, Icecast, Podbean, Stitcher, etc. and want to keep it that way, we’ve got you covered! WordPress allows you to schedule RSS Feed importation in a recurring manner. Simply record and publish episodes with your current publisher and they will automatically show up on your website! As your podcast grows month after month, having your own website with a total control over your files and your brand is probably the most important thing to skyrocket your show and monetize it. 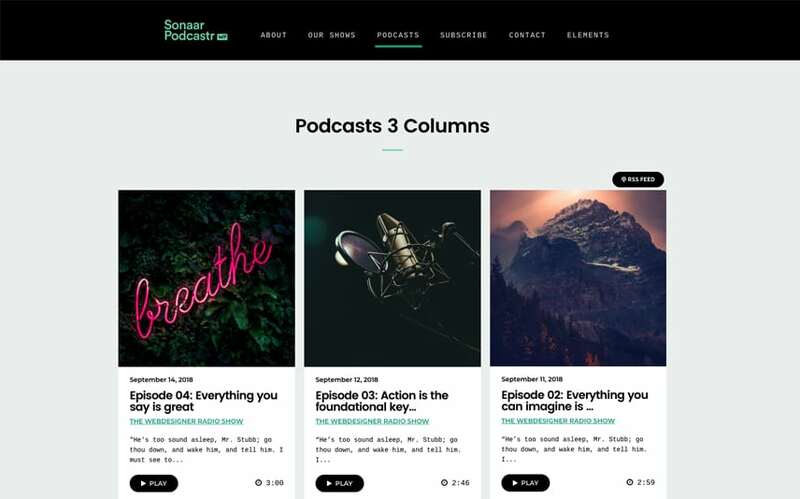 With Sonaar’s Podcastr WordPress theme, you have the choice to host your audio files directly on your web server … or fetch your episodes from an external server / host. One of the most amazing features of this Podcaster WordPress Theme is the Podcast audio player itself. There are 3 unique and outstanding characteristics that make this theme a winner for every podcaster. First, the continuous audio player allows your listeners to navigate your website without any interruption to the audio when they switch or load a new web page. Thanks to our mobile-friendly AJAX continuous player! Secondly, our jaw-dropping real-time soundwave visualizer on the audio player is definitively a key-factor for every state-of-the-art podcasting website in 2019. Finally, by using the theme options panel, you can easily customize the player’s look and feel to your brand by setting unlimited colors and Google fonts! 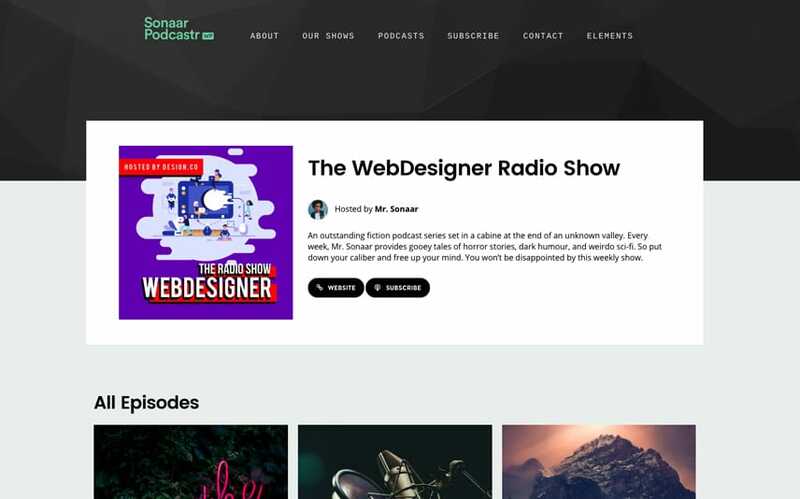 Podcastr WordPress Theme is crafted for any podcast producers. If you have a single show or have a podcast network to display on your site, this is the theme you need! 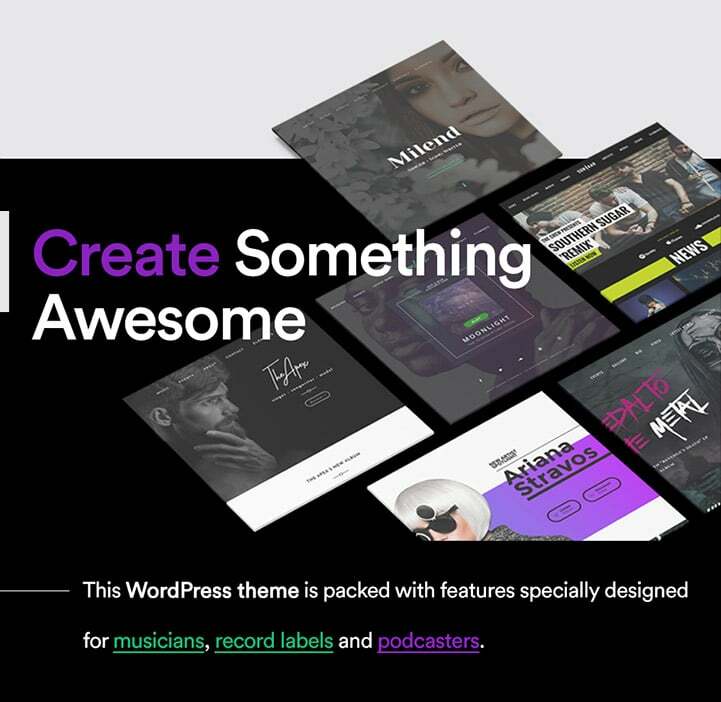 You see, we did our homework and we’re proud to say that we have yet designed the most flexible and best WordPress theme for podcasters ever. From your WordPress dashboard, you will be able to manage unlimited Podcast episodes and unlimited podcast shows. All with customizable category filters and search bar that can be displayed into multiple pre-designed page layouts to fit your personal needs. By using our easy drag and drop page builder, each of your episode’s page or podcast show’s page can be customized from A to Z. Finally, you will be able to manage your podcast’s, Google Podcast’s and iTunes feed straight from your WordPress dashboard! Easily share your episodes and promote your podcast show across Facebook, Twitter, Tumblr and all other social networks with 1-click from each page of your podcast website. We know that customer support can be a deal breaker when it comes to downloading a WordPress theme. 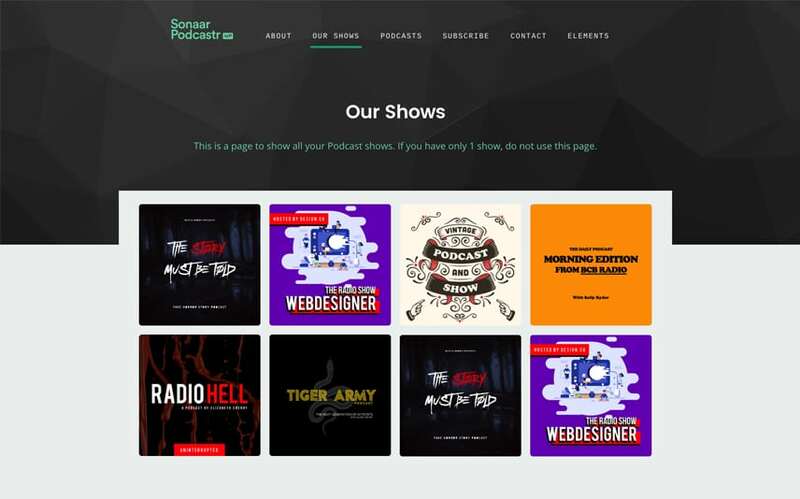 Where free podcast WordPress theme don’t offer customer support, here at Sonaar.io we do have a live chat opened during the business hours to answer questions and give technical support for all of our customers. With each purchase of this premium theme, you will get 1 year of free support and theme updates. We have also a lifetime licence available in case you think you’ll need extra support.